Rainbow Rowell tells this unexpected love story from both Eleanor and Parks’ point of view. Eleanor is just getting back after her step father, Richie kicked her out a year ago. Now she is going to a new school where she is definitely an outcast. With big red hair, a big personality and just being over all big, this don’t look bright for her. Even the Asian boy, Park, who let her sit next to him on the bus, isn’t showing any signs of friendship. Park has been living in this town since birth. His mom is Korean and his dad is American. He’s not popular to begin with but adding this big redhead sitting next to him on the bus twice a day is not going to help his image. But soon the two begin to bond over comics and become an odd type of friends. Not expecting to fall for each other, but that changes fast. Now how will their relationship last, when things aren’t as Park expected at Eleanor’s house and he is not allowed over, and she feels uncomfortable at his house, and on top of all that someone keeps writing sick notes on Eleanor’s notebook. Will this first love turn into a lasting one? Find out in Eleanor and Park by Rainbow Rowell. 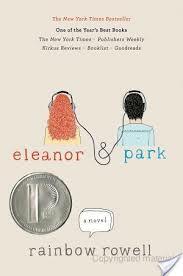 I loved Eleanor and Park! I read it in less than 24 hours. I fell in love with their love and Rainbow Rowell as a writer. There were a lot of unexpected twists and meaningful components. This not your average love story and has its funny parts that had me laughing out loud! It has a more real feeling to it that makes all us single pringles jelly. Rainbow Rowell is a truly amazing writer and I would recommend definitely Eleanor and Park! I would probably give it a 9/10. The only reason it’s not a 10/10 is because there was no EPILOGUE!! A note to all authors I ALWAYS NEED A EPILOGUE! DON’T LEAVE ME HANGING!! Have you read Eleanor and Park? If so, what did you think? Any book review suggestions? Let me know in the comments! I love seeing your feedback! p.s. I am sooooo sorry I have not posted in soo long. School, reading and friends have left me without a minute to spare. I do have another book review written and a few in the works though, so those should be posted soon. Thank you to everyone who stuck with me through multiple posts a week and no posts in months! Happy to be back… Now will you read Eleanor and Park??? Great job, Hannah, and good to see you writing in your blog again. Welcome back! Thanks! I am thrilled to be back. I was just looking through my old notes on my Ipad, remember the Reading Rainbow thing we did? I have my piece for the Friday note on my Ipad. Man how the times have changed since than haven’t they? Girl I love that book. Very good book talk! That was a great book . . . hee hee hee.